27 | December | 2010 | SHANNARO!!! Dangnabbit, here I was certain Shonen Jump would take the Xmas off and then they have to come along and release a chapter on Sunday. Well, seeing as this chapter was particularly awesome in terms of kekkei genkei pwnage, I will forgive them for messing up my usual Thursday blogging schedule. First and foremost, I hope everyone had a great Christmas, Hanukkah or holiday. We here at Shannaro!!! wish everyone happy seasons greetings and we’ll do our best to bring more Naruto and other manga-related goodness in the coming year. 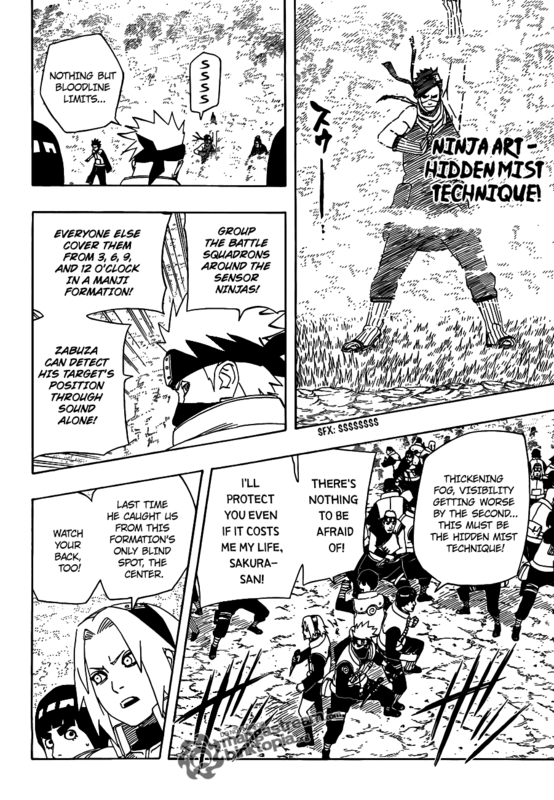 The funniest part in the chapter was definitely when Zabuza threatened Kakashi to shut his trap after the latter began telling Haku what Zabuza said after he was killed. 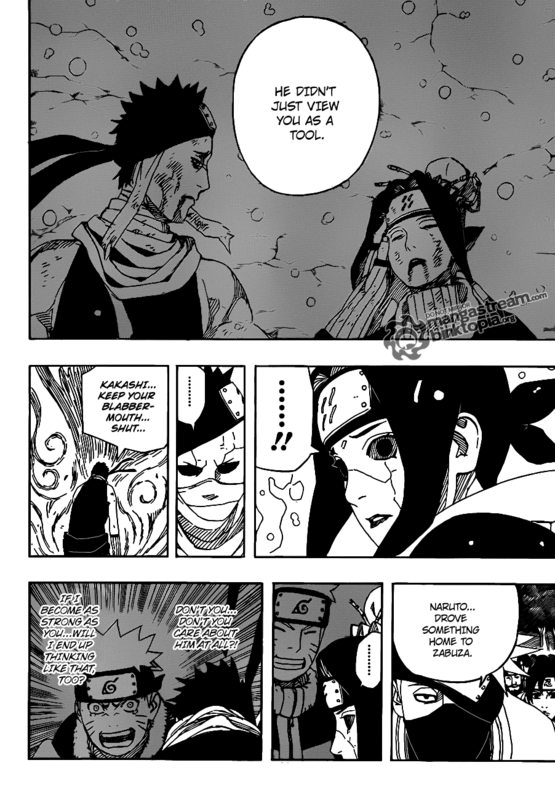 It’s these moments that make me wish Haku and Zabuza would have survived longer into the series; even though they were the first major villains in the manga, they were very well developed characters that were the first antiheroes of the series. Many of the villains introduced later on fit the bad guy role to a T, which made me really miss guys like Zabuza. If Kishi was accepting suggestions for short spin-off chapters (ie. 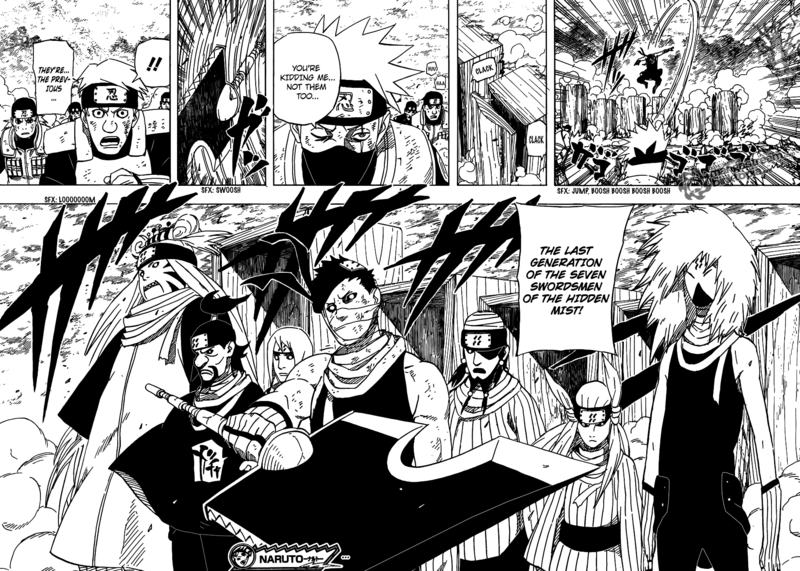 kakashi gaiden), I definitely think a Zabuza & Haku story arc would be interesting to read. – Kabuto appears to have switched tactics to suppressing each summon’s personality in order to prevent further souls from being freed. But doing so forces him to channel additional chakra and require more focus. Originally, I thought suppression of the personalities would reduce the summons’ combat prowess, but that doesn’t appear to be true as Kabuto has proven he can command four individual bodies in battle while still utilizing all their special abilities. Which brings me to the point of how he is doing this without something like the Rinnegan… Remember that even with the Rinnegan, Pein was only able to control six bodies simultaneously and had to be located relatively closely. Yet Kabuto has summoned an additional six bodies this chapter and is probably several miles from the site of the battles. – With Kabuto now suppressing the souls of any summon he sends into battle, the prospects for Kakashi’s army to defeat these indestructible zombies aren’t looking great. They’ll have to fall back on the old methods of either sealing the summons or completely incapacitate their bodies somehow. The only countermeasure I can think of right now is Kakashi’s mangekyou sharingan ability as it can warp the body away. But seeing as how he can only use it a limited number of times before collapsing, they’ll have to come up with some new ideas to deal with these regenerating undead, and fast. – Gari, the former member of the Blast Corps from the Hidden Stone has a unique Blast element kekkei genkai. 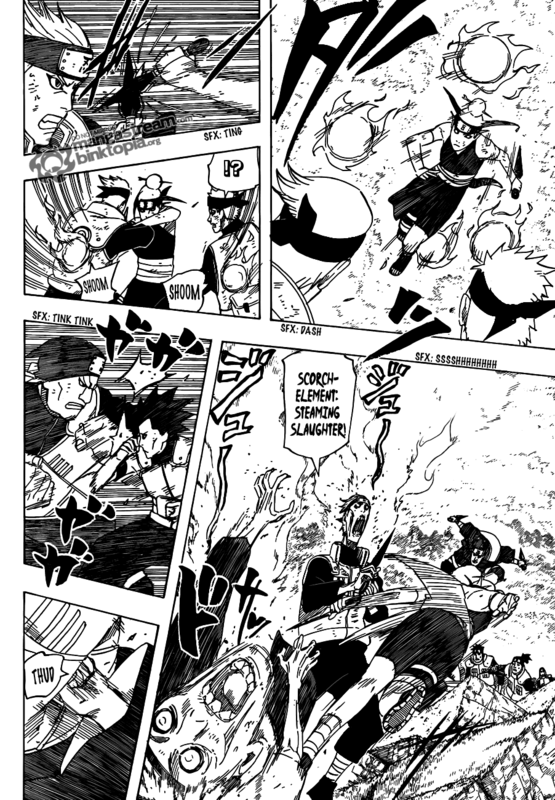 The technique uses the same high power explosive forces used by Deidara, but is delivered through physical contact. – Paku, the girl from the Hidden Sand uses something called Scorch element as her kekkei genkei. From what I can tell, she scorch element essentially boils off all the water in a person’s body leaving them as dried up mummies. Mostly likely it’s fusion of fire and wind chakra. – Combined with Haku and Zabuza, these four definitely make a threatening team, but I had my doubts about how long they can preoccupy an entire army division with Kakashi in the lead. But it looks like Kabuto isn’t about to give Kakashi time to plan a counterattack as he brings out another trump card summons: the previous of generation of the Seven Swordsman of the Hidden Mist. – After hearing about the notoriety of the Seven Swordsmen in the Naruto series, it’s about time we finally get to see the complete group in action. One worrisome fact is that they would be missing their trusty blades but the sudden appearance of Zabuza’s beheader sword in this chapter raises some hope. Zabuza’s sword is in the same condition we last saw it when Suigetsu damaged it fighting at the kage summit, so we know it’s not a copy Kabuto prepared. So the mystery is how it appeared here all of a sudden when even Suigetsu believes it was confiscated by the Land of Iron samurai? Could each sword be bound to the soul of its original owner somehow and be summoned at will? If so, Killer Bee might have to say goodbye to his friend Samehada real soon.